Matt Chapko (left) and Ragita Pramudya both earned master's degrees in food science with an emphasis in sensory and consumer sciences from Bumpers College in August. FAYETTEVILLE, Ark. 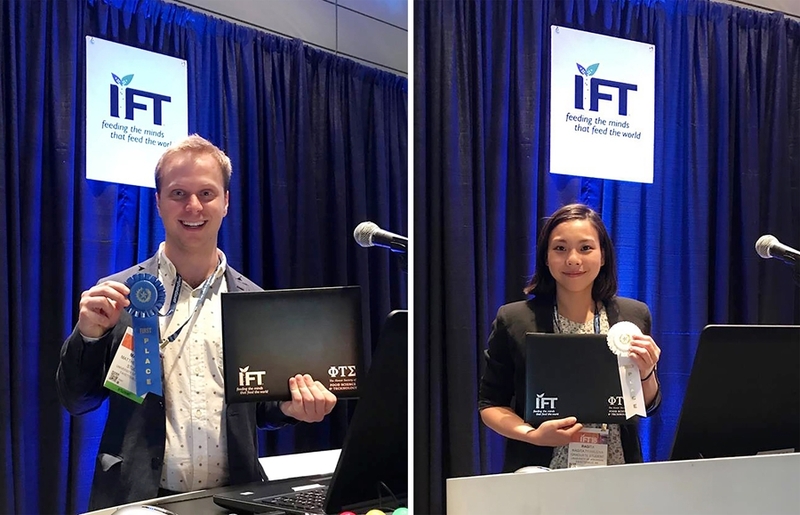 – During the summer, U of A food science master's degree students Matt Chapko and Ragita Pramudya earned first and third-place finishes, respectively, in oral presentation competition at the Institute of Food Technology national conference in Chicago. Chapko won the IFT oral presentation competition with his research, "Coffee Considerations: Influencing Sensory Perception by Modifying Serving Temperature. Pramudya tied for third with her research, "Touching Pleasant Coffee: The Influences of Hand-Feel Touch Cues on Emotional Responses and Touch Associations." Chapko's findings revealed variations in product temperatures have a significant effect on how sensory attributes, such as aroma, flavor and mouthfeel, of beverages are perceived. Higher brewed coffee temperatures, along with enhancements such as creamer and sugar, mask potential perception of specific positive and negative attributes. To experience the true flavors of brewed coffee, it is recommended to let the coffee cool slightly, allowing for a more complex "bouquet of flavors" to be perceived. The results of Pramudya's study revealed evidence of cross-modal associations between hand-feel touch and taste cues. The findings not only emphasize the importance of hand-feel touch cues in product evaluation, but also encourage professionals in food and beverage industries to consider packaging or container designs more carefully. Chapko and Pramudya each earned food science master's degrees in August from the U of A's Dale Bumpers College of Agricultural, Food and Life Sciences with an emphasis in sensory and consumer sciences. Associate professor of sensory science Han-Seok Seo served as their advisor. "It is a great pleasure and honor to work with outstanding students who consistently challenge themselves every single day," said Seo. "Their dream, grit, action and teamwork throughout graduate school led to amazing accomplishments. I am very proud of both of them." Chapko, who is from Rogers, also earned his bachelor's degree in food science. Pramudya, who is from Indonesia and grew up in Singapore. She earned her bachelor's degree in food science from the University of Wisconsin at Madison and beginning work on the doctorate this fall at the U of A. For more information on food science, food safety, and food science STEM camps or departmental tours, please email student relations coordinator Rosa Buescher at rosab@uark.edu. Since 1939, IFT has been advancing the science of food and its application across the global food system by creating a forum where individuals from more than 90 countries collaborate, learn and grow, transforming scientific knowledge into innovative solutions for the benefit of people around the world. About the Dale Bumpers College of Agricultural, Food and Life Sciences: Bumpers College provides life-changing opportunities to position and prepare graduates who will be leaders in the businesses associated with foods, family, the environment, agriculture, sustainability and human quality of life; and who will be first-choice candidates of employers looking for leaders, innovators, policy makers and entrepreneurs. The college is named for Dale Bumpers, former Arkansas governor and longtime U.S. senator who made the state prominent in national and international agriculture.